ON WHICH DAYS WERE THE CRUCIFIXION AND RESURRECTION OF CHRIST? What are the recorded facts of the crucifixion and resurrection? There is but only one dependable and historical record on this, the Bible, and any tradition that conflicts with Gods word must be dismissed. The Pharisees demanded proof and Jesus offered only one, his length of time in the grave, THREE DAYS AND THREE NIGHTS. Now of course, if Jesus did not fulfill that sign, he was an impostor and there is no Savior. Satan has caused people to ridicule the story of Jonas, and set up their own tradition that denies that Christ is the Messiah. Theologians and scholars claim that Christ was only in the grave one-day and two nights, only half as long as he said he would be. In doing this they deny the only proof that he is our Savior. They claim that he was placed in the tomb shortly before sunset Friday and rose at sunrise Sunday, only two nights and one day. To follow in this tradition is to reject the scriptures and Christ. It was not until after the last of the twelve apostles had died that the Good-Friday Easter-Sunday tradition began, and spread through the church, this tradition has continued unto this day deceiving a great deal of people. "And God divided the light from the darkness. And God called the light Day, and the darkness he called Night. And the evening (Darkness) and the morning [Light) were the first day.... And the evening and the morning were the second day.... And the evening and the morning were the third day" (Gen 1:4-13). Did you get that? A period of darkness and light equal one day, three periods of darkness and three periods of light equal three days. he understood that there are 12 hours of day and 12 hours of night. Jesus had to be in the grave exactly 72 hours (36 hours of day + 36 hours of night), and rising at the time of day that he was buried or he would have been a liar. For a division of time based upon time separation back then, see this Chart. Jesus ate the Passover meal with His disciples at the beginning of the 14th. Jesus was then betrayed by Judas, arrested and during the night brought before the high priest. Jesus was crucified and died around 3 p.m. This was the preparation day for the annual —not weekly—Sabbath. Jesus body was placed in the tomb just before sunset. This was a high annual Sabbath day, the first day of the Feast of Unleavened Bread. It is described as the day after the “Day of Preparation”. Wednesday night and the daylight portion of Thursday were the first of three days and nights in the tomb. The high annual Sabbath day was now past and the women bought and prepared spices for anointing Jesus body before the start of the weekly Sabbath day, which begins Friday at sunset. Thursday night and the daylight portion of Friday was the second of three days and nights. The women rested on the weekly Sabbath. Jesus rose near sunset, exactly three days and three nights after he was placed in the tomb. The women brought the prepared spices early in the morning while it was still dark. Jesus had already risen. He did not rise on Sunday morning, but near sunset the day before, three days and three nights after being put in the tomb. So which day was the crucifixion on, and does the Bible back it up? Lets look at what the Bible has to say. According to scripture, Jesus was crucified on Passover, Passover was the day before the annual high Sabbath day of unleavened bread. The preparation for the feast of unleavened bread, a annual high Sabbath, was the day before placing it on Passover. To verify what a high Sabbath day is, turn to Leviticus 23, you will notice that the annual holy days were also called Sabbath days. According to the Hebrew calendar, Passover fell on Wednesday in the year 31 AD, and that would place the crucifixion on Wednesday, the preparation day for the feast of unleavened bread. Christ was in the grave three days, that would make the crucifixion on a Wednesday. 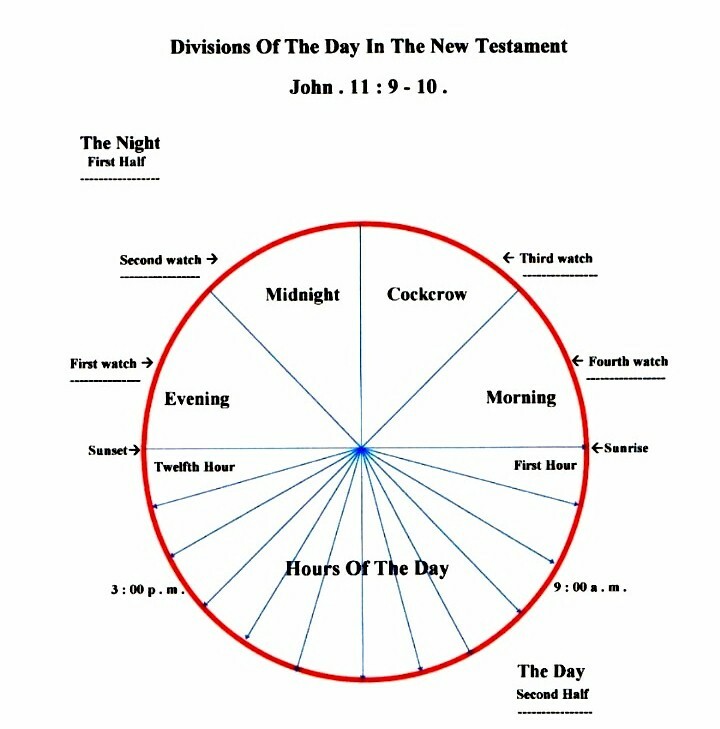 We have now seen that the day of Christ's crucifixion was on Wednesday, but does the Bible tell us of the time of day? Jesus was raised on the cross at the third hour (9a.m.) (Mark 15:25) and breathed his last breath at approximately 3p.m. "And about the ninth hour (3p.m.) Jesus cried with a loud voice.... Jesus, when he cried again with a loud voice, yielded up the ghost." (Matt 27:46-50) also Mark 15:34-37 and Luke 23:32. Jesus had spent approximately six hours on the cross. Hence Christ died approximately 3p.m. and was buried before sunset because of the preparation day, he was buried late in the day. There should be no doubt that Jesus was NOT crucified on a Friday, but that he was crucified on a Wednesday becoming our Passover sacrifice. One last note here, in Daniel's prophecy of the seventy weeks, Jesus was to be cut of in the middle of the week. This prophecy speaks of his being cut off three and a half years into his ministry, yet it is significant that he was also cut off literally in the middle of a week. Which Day Was the Resurrection? Now, before determining the day of his crucifixion, let us determine his day of resurrection, this in turn will give us what we need to determine the crucifixion day. "In the end of the Sabbath (Saturday), as it BEGAN to dawn toward the first day of the week (Sunday), came Magdalene and the other Mary to see the sepulcher.... for the angel of the Lord descended from heaven...And the angel said unto the women, fear not for I know that you seek Jesus, which was crucified. He is not here, for he is risen, (he had risen prior to dawn) (Matt 28:1-6). "And when the Sabbath was past, Mary Magdalene and Mary the mother of James and Salome, had bought sweet spices that they might come and anoint him (Jesus). And VERY EARLY in the morning the first day of the week, they came to the sepulcher at the rising of the sun.... And entering the sepulcher they saw a young man ... And he said to them, be not afraid, you seek Jesus of Nazareth which was crucified: he is risen; (past tense, has already risen)" (Mark 16:1-6). "Now when Jesus had risen EARLY, on the first day of the week he appeared first to Mary Magdalene (his first appearance was on the next day after rising)" (Mark 16:9). "Now upon the first day of the week, very early in the morning, they came unto the sepulcher...He is not here, but is (has) risen:... It was Mary Magdalene, and Joanna, and Mary the mother of James, and other women that were with them, which told these things unto the apostles. Most people suppose that these texts state a Sunday sunrise resurrection, but they do not say that, it was very early, the sun was beginning to rise, and Jesus had already risen before they got there. They arrived just before dawn of the first day of the week (Sunday), scripture does not tell us the exact moment he rose, but we know it was some time between his being placed in the tomb and prior to the the Mary's showing up at the grave. Christ died at 3pm, it most likely that it took at least an hour to get permission to take the body and bury it. So some time after 4pm he rose, a time when there were no witnesses to record it. The accounts appear to support that there was more than one visit to the tomb by different visitors. The evidence is that there were different people visiting the tomb, and differing numbers of angels/men at the tomb supporting multiple visits and differing times. It is now up to you to choose whether to worship in truth or fantasy, only you can make the right choice.